I love it! I just finished one. I cannot wait to take a photo with a wonderful baby in it. Thank you so much for sharing! Pattern updated 4-4-2011. Please email me or leave a way to contact you in the comments if you have questions. Could you please post the gauge and/or finished measurements for this project? Thanks. @BrittanyFinished size - 12 inch opening, about 9 inches deep. The baby in the picture weighed about 8 lbs and was 18.5 long. Lovely! I'm not sure what the numbers in parenthesis at the end of a rnd stand for. Are they the number of stitches in all in the round or the total times you do this? For example; do I do 3hdc and 2hdc for a total of (30) stitches and go to the next rnd or do I do this 30 times? Thanks for any input you can give. When you finish the round that is how many stitches you should have. Confused?...Do I chain 2 at the beginning of each row? @Dagmar No, when you finish the round you are working on you start the next round. This is a continuous round with no seam. Okay I felt really silly after posting that. lol. I did figure that part out. I did attempt to make this pattern but it didn't turn out big enough I basically just have a circle...? Not really sure what I am doing wrong. I am using the correct size hook and yarn as well as following your pattern to a 'T'...??? Been there! It does look like a big old circle until you start the rows without the increases at the very end. If you wanted it a little snugger at the opening you could always add a couple of SCtog evenly around. Okay so now it looks like it's 'morphed' into an oval. But it just doesn't look big enough for a baby! 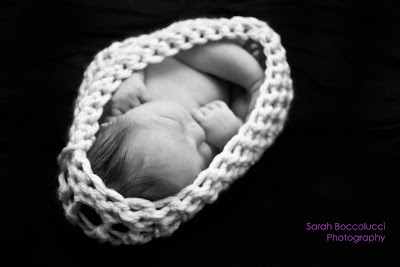 This fit the newborn in your photo beautifully. I know that you said you had to add on 2 more rows as well... Easy enough to make though! Only took 45 minutes to do! I used a size 5 yarn with a size Q hook and it turned out amazing using your pattern! It is gorgeous and airy! I would love to see a picture of it! What an awesome cacoon! I am having a little bit of trouble and hope you can help... I have tried to do this pattern now 3 times and I keep ending up with a small, tight circle. Yours seems to have large open stiches. I am following the pattern by using half-double crochet stitches and following the stitch count () exactly.. Am I using the correct stitch? That is in the original pattern. Thank you so much for sharing this! I love it! 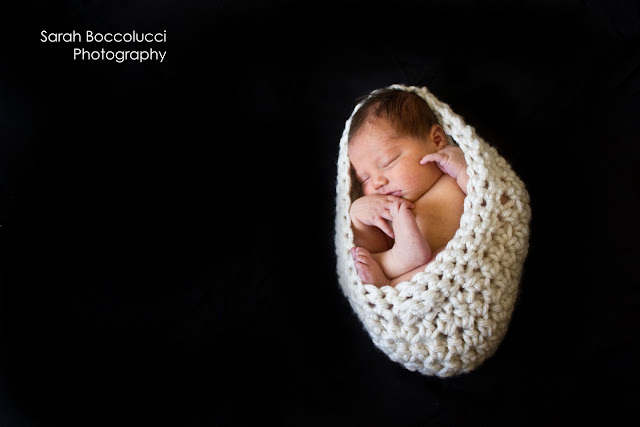 Beautiful cocoon! I am due with #3 on 8/20/11 and my sister is due with her #2 on 8/21/11, so I am going to make one for both of us right now :) I will post photos on Ravelry when I am done (my username is osuraccoon). Haha! What can I say, it is a long name and sometimes I get carried away ;) Thanks for letting me know and congratulations on your growing family. I have tried numerous times to make this cocoon. I don't quite understand the pattern. Email me at gngrkb@yahoo.com to HELP me...PLEASE. I need one made by November! Thanks for your help and time. I used the Q hook. I was just not happy with the middle so used the magic ring technique and did the 12 hdc's in that. Nice and neat. 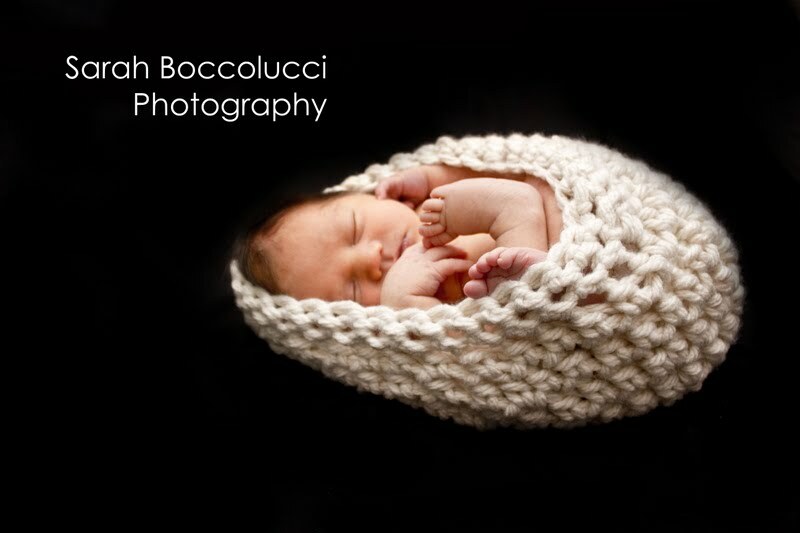 This is a lovely cocoon and a very easy pattern to follow. A friend is having a baby and I wanted something unique to give her at her shower. This pattern is perfect. It worked up in 20 minutes flat and looks absolutely stunning. I'm going to add a ribbon and maybe a flower as well to make it extra girlie. Thank you for posting this pattern! You are the best! I just made this for a friend. She loved it and take baby photography. I done have a baby to test it out so I made it with the two extra sc rounds. Thanks so much! This is the exact pattern I was looking for! A friend of mine does photography so we're trading her skills for mine! THanks! Thank you so much for making this available free....and as a recipient of a St. Jude mechanical heart valve three years ago, this Etsy crafter will certainly be making a donation when I complete this....I'm sure I owe them much more...thank you! HI - I need a little help. I'm almost finished and it looks like a floppy hat! It measures across at about 15 inches but i can lay it flat almost like a doily. Any ideas what I could have done wrong? It should look like a floppy hat. You can always add a couple decreases in the last rows if you want it to get tighter around the opening. @Sarah One other questions for you..how much yarn did you end up using? It seems I hardly used any of my skein? I'm a real newbie to this so when you said 12ply was I supposed to somehow triple my yarn from the 4ply Wool-ese chunky to make it 12ply? Well I'm trying to make this one and I realized I really need to get the right hook.. thought M would be big enough but no.. will redo and try again! i am so confused .. i am at the end of the pattern and nothing is coming out right... and i am fallowing it to a T. should i end up were i started in the rows or not. i am totally confused. cause when i do the 42 it just doesnt add up. I am almost finished with this project but I don't understand "bind off" in crocheting. Can anyone explain that or tell me where I can find the instructions. Thank you and my sister and I love this pattern. Hi! So sorry I left the wrong email address in my earlier message; it should be tlwelch60@comcast.net. Thanks - hope someone can help me. I had a difficult time to until I realized that each row was a repeat, for exapmple: 1 HDC in next 2 stitches, 2 HDC in next stitch; repeat. Usually this is written in patterns with a * on each end to show what's to be repeated. If that makes sense. I originally read the above as being 1 HDC in the first stitch and 2 HDC in the REMAINING stitches. I felt stupid after doing this and ripping it out 3 times! I hope that helps! Thank you for sharing your pattern! Just found this pattern and love it. I have tried it and it is not turning out right. 1st I am using a different yarn (only bulky yarn that was available at store) 2nd it keeps coming out more like a hat than anything else. What can I do? should I just keep increasing or try another way. I love this sweet pattern! I would love to feature this pattern on The Firefly Hook's Free Pattern Friday. Would you let me know if that's okay? And also let me know if I can use a photo of the cocoon from this post - when your pattern is featured the photo will link back to your blog and our readers will view the pattern here on your blog. Do you have any suggestions about how I can start this pattern with a magic ring? I made this using Lion Brand Wool-Ease Thick & Quick in Cilantro. I added one more increase round (I think I tend to crochet a little more tightly). I added one round of SC using Lion Brand Fun Fur in white. The pattern directions are fine and this is an easy pattern even for a beginner. It took me about 2 hours start to finish. Thanks for posting! Do 12 HDC in the magic circle. That's how I did it. Then just follow the pattern. I do have 2 questions please. I have lion brand thick & quick yarn also & was wondering what hook sz I should use? I think it's super bulky 6. Secondly, is the ring marker moved up during each round? I'm not familiar w/ working in round. Much appreciated & many thanks! I just made one of these and it would have worked up in about 45 minutes had I not had to modify the pattern. I was not happy with such a wide opening so I dc every 5 stitches with a hdc2t for 2 rounds. That satisfied. What width or mm of ribbon would you suggest for this? I dc every 5 stitches with 2 hdc2t in a row all the way around for 2 rds. That's the same yarn I picked up the other day :) Could you yell me which size hook you used? I love this pattern, but I do not crochet. Would you happen to have it written out for knitters? Sent you an email re: the pattern :-). Thanks! If you go the decrease route to close the cocoon up a bit (1 DC in every 5 then the 2 HDC2T), does this replace any of the rds in the pattern or are they additional before you'd finish off with the 2 rds of SC? Both of my married daughters just told me they are expecting! I really want to make a cocoon for each of them. I think I need a little help... my experimental version just looks like a shallow round dish. Would it be because I just experimented with standard yarn and a "G" hook? UPDATE: Do not experiment with smaller yarn & hook. I am nearly finished with the real thing and it's shaping up perfectly. Thank you for sharing. I'm so excited... I don't know how I will wait until the Fall! Thank you for the pattern Sarah, it's lovely. I just wonder, I see the stitches grow from six to 42 and then two more rows of 42. But in the picture it seems to close a bit before the 'hole'. Don't you need to reduce the stitches the last rows? When folded in half like a beanie what should the measurements be virtically & horizontally? Nice blog and your all presenting information are very great and it's really good well done. Thank you for the pattern, but I did it twice with two different types of bulky yarn, and it was so small, a doll would not probably fit in it. I finally did it with a less bulky yarn and I still had to add at least 9 more rows on it to actually fit to your measurements. I have never had so much trouble to crochet a pattern before. Thank you so much for this beautiful and simple pattern! I have no baby to try it out yet but can't wait! Hi, I just found this beautiful pattern, but I can't find the yarn you recommended. Are there a few other brands that can replace the Lions Brand? There is a LB wool ease thick & quick.